Ages 6 and up. Here is a collection of 11 easy-to-learn, "high-energy" rap and rock tunes that can be used to teach basic language skills that are essential for success in the classroom. Songs and activity worksheets are provided to help children master instructional objectives that are emphasized within the classroom curriculum. Synonyms, antonyms, parts of speech, plurals, possessives, question forms, distinguishing facts from opinions, and other skills can be taught using the songs. The activities are perfect for students who have experienced difficulty acquiring basic language and literacy skills. 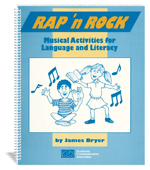 The complete Rap and Rock kit includes the manual and a ready-to-use CD with the songs.